100 % electrical excavation with 0 %emissions. The flexibility in interior demolition knowsno bounds. The excavator 803 with dual power and theHPU8 are a perfect team. Easy to transport: Two openings are inset in the dozer blade in which the HPU8can be suspended for transport. The dimensions of the 803 and the HPU8 are perfectly matched to each other so that the team can easily drive through narrow doorways. Best in class in terms of cabin size. In addition to its comfortable cabin, the ET16 also impresses with a compact and sturdy design. With a shipping weight of less than 1.6 tons, it can be quickly and easily transported from one construction site to the next. It is the ideal companion for any application due to a simple and safe operation. Full operating power on smallest space. And everything you need in the tough daily routine. The EZ17 is a real miracle of power and space. Everything is installed on smallest space here but without leaving power and backup reserves to be missed. This adds to work satisfaction. Because the large volume diesel engine and the new cooling system promise high performance and efficiency also in high surrounding temperatures of up to 45 °C. This way you will always get the best out of any job. 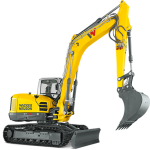 The new compact excavator generation in the 1.7 to 2.4 t class. The everyday routine on a building site can sometimes be hard and unpredictable: all the more important, therefore, to be able to rely completely on your work equipment. 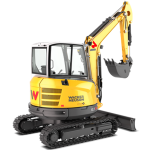 Power, efficiency and high visibility are the core values of the ET-Series from Wacker Neuson. The big diesel engines and new, innovative hydraulic system set new standards of operation. You can get the best out of your job without ever feeling the strain. Performance and economic efficiency perfectly combined. 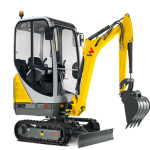 The ET65 is an excavator like end users want it to be. 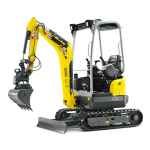 A highly efficient machine that surprises with its compact design and maneuverability. 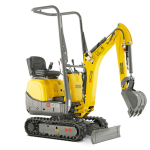 Thanks to the high digging power and the powerful engine, the strong excavation performance is added bonus points that make the excavator into an all-rounder on the construction site. With the articulated boom, it also has a large reach, digging depth and dumping height. The fuel consumption of the ET90 is up to 20 percent lower than with comparable models – this reduces the operating costs significantly. 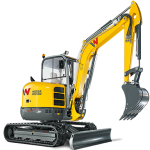 At the same time, it scores in applications with an excellent engine and hydraulic performance. This efficient combination provides for first-class digging power with up to 20% more bucket breakaway force. Conversely, the economical load sensing hydraulic system allows for finely controllable lifting arm movements with a full performance at the same time. 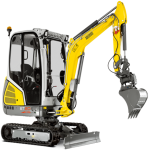 Whether power or precision – the ET90 is exactly the right excavator for any application. 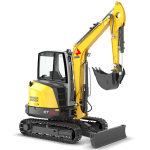 The champion of the compact excavators. 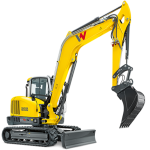 Wacker Neuson’s ET145 offers massively enhanced performance, without the size of the excavator ever posing a problem. Its performance, stability, and agility are perfectly balanced. The EZ36 is full of detailed solutions that increase productivity and make working for the operator even more enjoyable and efficient. The intuitive operating concept, combined with precise control, shortens working cycles and saves time and money. In addition, many options can be installed ex factory. Best performance of its class. High excavation performance even in hard to reach areas. The EZ53 is the perfect equipment for operations close to walls or buildings. The tail of the EZ53 does not reach over the undercarriage in no operating position at any time. The minimized space requirements are extremely practical on construction sites in busy city centers or on road construction sites with ongoing traffic. 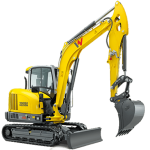 But not only its operating dimensions are convincing, also its material handling and digging performance are impressive. Copyright © Ferrybridge Ltd. 2014. All Rights Reserved.